It’s all too predictable, after every criminal shooting or act of terror involving a firearm, within hours of the event, the emotionally driven anti-gun brigade with the full support of the mainstream TV and print media, dance on the graves of the poor souls that perished to push a misguided agenda. 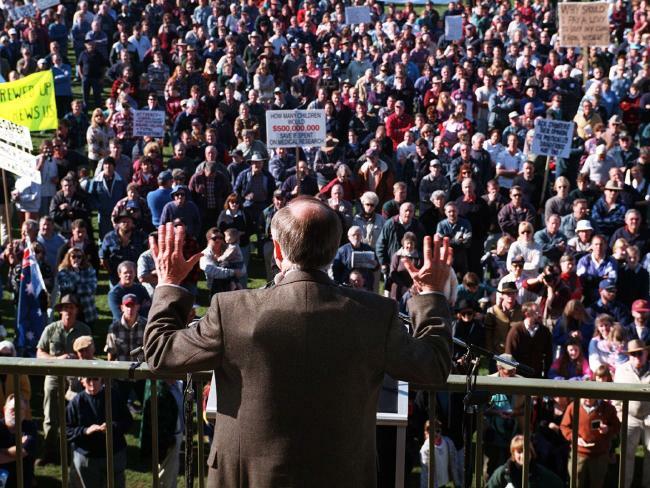 Australia’s gun control experiment is often cited as “the model where gun control has worked” because of the lack of mass shootings since the introduction of the National Firearms Agreement in 1996. The agreement restricted the ownership of self-loading rim fire and centrefire rifles, self-loading and pump action shotguns. Only those persons that meet specific occupational purposes are allowed access to these restricted firearms. 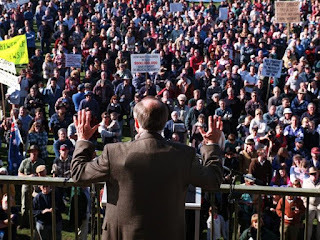 Our spineless former PM John Howard, wearing body armour whilst addressing a pro gun rally. It is a fact that there has not been a mass shooting in Australia since the introduction of the NFA, however our friendly neighbours New Zealand, haven’t had a mass shooting in the same time period. New Zealander’s still have access to self-loading rifles and those with a collector’s license can still purchase fully functional machine guns. Using the logic of the Australian gun control lobby, New Zealand should be an absolute bloodbath with mass shootings every week because of the evil “assault rifles, machine guns & machine pistols” that are still available to the licensed, law abiding citizens. Notice the last four words of the previous sentence: licensed law abiding citizens. New Zealand has placed greater emphasis on vetting the individual before they are issued a license, rather than restricting the types of firearms people can own. A self-loading rifle is no more dangerous than a single shot 12 gauge whilst in the possession of a licensed, law abiding citizen. New Zealand tried the experiment with firearms registration in the 1980’s, however it was found there was no public safety benefit by keeping those records. Just recently, Canada has also scrapped their long arms registry. It doesn’t matter how many laws are already in place, the gun control lobby will always push to restrict private gun ownership further until there is an outright ban. Gun control activists like to use terms such as high power, rapid fire, assault, large capacity, killing machines etc to invoke an emotional reaction from their audience. The media portrays them as saints that are saving the world, however they are nothing more than individuals that suffer from a terrible sickness. They push their agenda under the misnomer of public health/safety. This raises a simple question that must be asked. If private ownership of guns were made illegal, would the gun control lobby simply close up shop, or will they continue to lobby the government to make guns even more illegal because the criminals will continue to possess and use firearms? Over the last 19 years, there have been changes made to firearms legislation that have achieved nothing. We have had magazine capacity restrictions, caliber and barrel length restrictions for handguns, reclassification of firearms based on their appearance, rather than their function. We have had ridiculous policy changes from the police that issue the licenses and permits to purchase a firearm (yes, you read that correctly, in Australia we have to obtain a permit from the police to purchase a firearm, even an air rifle!). The goalposts are forever changing and there is zero uniformity between the states except for the classification regime. On the 15th December 2014 in Sydney’s business district, an Islamic terrorist took hostages inside the Lindt Chocolate Café. (https://en.wikipedia.org/wiki/2014_Sydney_hostage_crisis) During the inquest after the event, it was found that the terrorist, Man Monis was armed with an illegally obtained and illegally modified pump action shotgun. Further investigation determined that the shotgun’s serial number was never recorded as being imported nor was it ever held by a licensed individual. As a result of the inquest, the following recommendation regarding firearms was made: The Commonwealth, States and Territories should simplify the regulation of the legal firearms market through an update of the technical elements of the National Firearms Agreement. A lawful gun owner who reads the above statement from the inquest would think that life would be made easier for them to participate in their chosen lifestyle or pursuits, or so it would seem. The review is underway, and the preliminary document is expected to be presented to the Royal Crime Commission Safety Council on the 5th November. This will be followed by COAG (Council of Australian Governments) meeting on 27 November that will consider recommendations on amnesties etc, then the police ministers meeting on 13 Feb 2016 will consider changes to NFA. The police ministers meetings are attended by police commissioners (political appointees) and police ministers (our supposedly democratic representatives). Some pro firearms rights activists have had meetings with their elected representatives that are privy to the preliminary document and have come to the conclusion that there will be changes made to the NFA that will not be good for firearms owners. As always, unelected bureaucrats that have little or no idea on firearms, with input from the anti-gun lobby will try again to place even tighter restrictions on lawful gun owners. 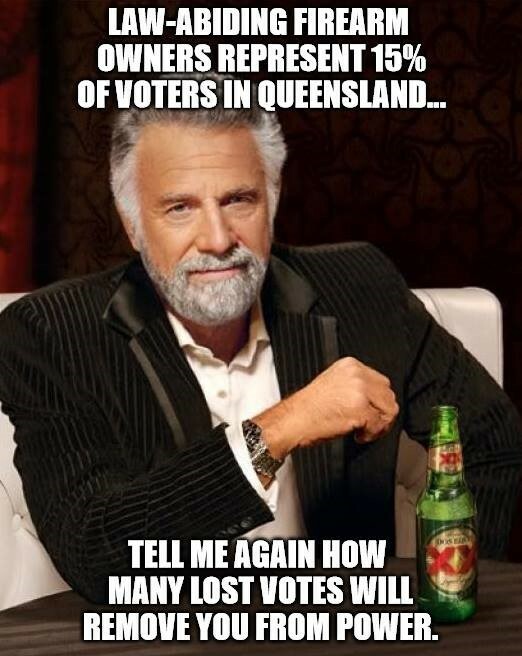 We will vote you out of office if you restrict legal gun ownership any further! Ultimately, this leads me to my conclusion. Use Australia as an example, not of how gun control has “made everyone safer” but as an example of how gun control fails! See it for what it really was and continues to be, a waste of taxpayer’s money, a huge loss of personal liberty and a system that once it starts, could take many lifetimes to stop. They will keep chipping away at you until there is nothing left to take. Don’t give them a single inch.